One beautiful quality that our Blessed Mother had to perfection was fidelity. This fidelity towards her Son was first manifested in her fidelity to Elizabeth. 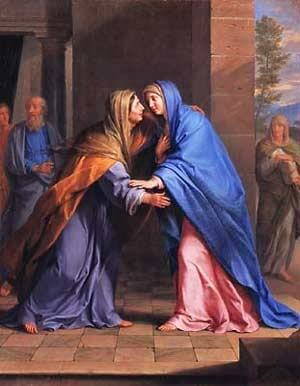 Mother Mary was pregnant herself, yet she went to care for Elizabeth during her own pregnancy. She dedicated three months of her time doing what she could to make the last months of Elizabeth’s pregnancy comfortable. She would have been there to listen, to understand, to offer advice, to serve and to simply express that she cared. Elizabeth would have been greatly blessed by the presence of the Mother of God during those three months. The virtue of fidelity is especially strong in a mother. As Jesus was dying on the Cross, His dear mother would have been nowhere else except on Calvary. She spent three months with Elizabeth and the three long hours at the foot of the Cross. This manifested her great depth of commitment. She was unwavering in her love and faithful until the end. Fidelity is a virtue that is demanded from each of us when we face the hardship of another. When we see others in need, suffering, sorrowful or persecuted, we must make a choice. We must either turn away in weakness and selfishness, or we must turn to them, bearing their crosses with them offering support and strength. Reflect, today, upon the fidelity of our Blessed Mother. She was a faithful friend, relative, spouse and mother throughout her life. She never wavered in fulfilling her duty no matter how small or how great the burden. Reflect upon the ways that God is calling you to act with unwavering commitment toward another. Are you willing? Are you ready to come to another’s aid without hesitation? Are you willing to understand their wounds, offering a compassionate heart? Seek to embrace and live this holy virtue of our Blessed Mother. Choose to reach out to those in need and to stand at the crosses of those you have been given to love. Dearest Mother, your fidelity to Elizabeth during those three months set a beautiful example of care, concern and service. Help me to follow your example and to daily look for the opportunities I have been given to love those who are in need. May I be open to service in great and small ways and never waiver in my calling to love. Dearest Mother, you were also faithful to the end as you stood with perfect fidelity before the Cross of your Son. It was your motherly heart that gave you the strength to stand and gaze at your beloved Son in His agony. May I never turn away from my crosses or the crosses that others carry. Pray for me that I may also be a shining example of faithful love to all who have been entrusted to my care. My precious Lord, I commit to You with all my heart, soul, mind and strength. I commit to gazing upon You in Your agony and pain. Help me to also see You in others and in their sufferings. Help me to imitate the fidelity of Your own dear mother so that I may be a pillar of strength for those in need. I love You, my Lord. Help me to love You with all that I am.